Identified by Judith Sparhawk as a Milbert's Tortoiseshell. According to my handy-dandy butterfly field guide, this beautiful one is a Milbert's Tortoiseshell. Boy, I wish I had seen it! Interesting, the underside of the wings are dull brown, in 2 shades, but hardly any markings. Very nice shot, perfectly color coordinated with the flowers. 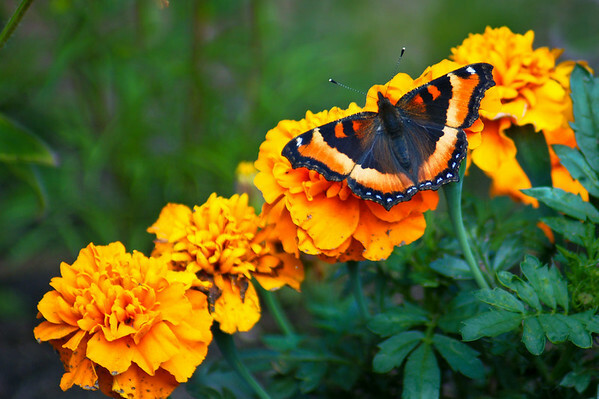 Great shot, I love the depth of colour of both the butterfly and the flowers. Wow, fascinating colors and lovely shot! I love the beautiful butterfly very much! Great catch!